What is the size of the solar tube? Who manufacturers the solar tube? We have Solatubes at work. Also have LED lights that work in conjucction withthte tubes. When sun is out Leds are dim. Sun gous in LEDS get brighter. You bearly notice the difference. I would recommend a 14" in a 14X14 room. Large tubes are made for large areas 18X18 with tall ceilings. If its just an 8 or 9' ceiling the light wont have a chance to spread and most if it will light up the floor. Most homes wont accommodate a 21" because of obstructions and they are mainly used for commercial industrial applications where large spaces are involved. You could always go with 2 smaller units spaced evenly apart. 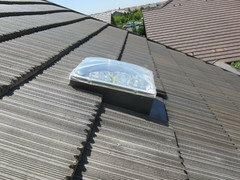 Also Solatube does not manufacture a 21" for tile Roofs. You would need to have a metal shop retrofit it to make it work properly for your application. Tile roofs need to be double flashed. Base flashing and top flashing together. Top flashing would also need to be flanged to direct water away from perimeter areas. What are the dimensions of this kitchen? - Can you share the dimensions of this kitchen and do you have any other pics showing other views of the kitchen (the fridge wall)? This kitchen has such a great warmth to it, I love it. Thank you! What is the name of this granite? the granite looks like "virginia mist". What color stain did you use on the flooring? I have oak kitchen cabinets and oak in our foyer when we bought our house. however we like maple floors but do not want to have the spend extra money to remove the oak. what color solid wood would you recommend for our floors so that it will not look crazy. I would always suggest staying with whatever species you already have in the home. Mixing species can make the house feel separated. What would be a good paint color if I want to go more in the cool tones over warm? - I have similar colored cabinets and counter tops. Would it be ok to paint in a cool color tone over warm? I was thinking in the cool blue greys. http://www.benjaminmoore.com/en-us/paint-color/springvalley is one idea or possibly http://www.benjaminmoore.com/en-us/paint-color/springvalley; http://www.benjaminmoore.com/en-us/paint-color/gardenoas is cool, but will be in keeping with the granite. what color are these counter tops? We are planning to go with lighter cabinets like these and possibly terra cotta floor. Not sure if our plan for black countertops is right. Thanks! We will share it with our customers and viewers! Love the pulls on lower drawers. Where did you find it? Thanks so much, Rhoda! Happy holidays! We are located in Mountain View, CA. If you are local, please feel free to give us a call and one of our designers can meet with you and talk about options for your new kitchen! Love the pendant light. Do you know the manufacturer? It looks like a Hubbardton Forge fixture (18-274) that unfortunately has been discontinued. Is that a Solar tube in the ceiling? I am considering putting one in my dark cherry cabinet kitchen, that also happens to have a dark corner. What do you think of the light it provides? I have identical cabinets and appliances, but am struggling with what color counter and back splash would give a dramatic appearance. I really want a "Wow" kitchen! Can you please let me now the wood and stain of both the cabinets and the floor. Thank you. The cabinets definitely look like cherry with a light stain, and the floor is oak with a bit of a stain as well. 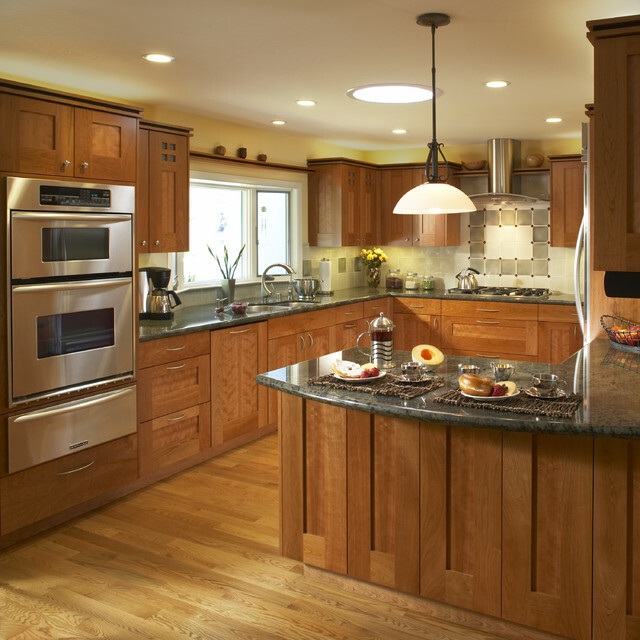 Kitchen Craft cabinets have a color called Cherry Nutmeg that's very similar. hardware for existing oak cabinets - Existing cabinets do not have handles. Desperately want to add them. Have new ss appliances and grey plank flooring. Will be replacing counter tops and adding backsplash. How do we pick handles and pulls? Is this a regular sized oven and a smaller oven on top of it? - I am looking for a smaller wall oven. Back Splash - What are the dimensions and color of the back splash tile? what are the measurements of this kitchen footprint? - Love the layout of this kitchen. what is the color of the granite? Countertop overhang? - What is the countertop overhang on the peninsula? Looks like you didn't need extra support for the granite? Hi! Love the cabinetry. Can you please share the type of wood and colo - Love the color and style. Very fresh and light. painting brick porch - What colors and kind of paint? A comment. - I had a natural cherry kitchen and granite counter tops almost this exact color. In the natural light the counter top looked like it had specs of gray in it. I chose Wickham Gray by Benjamin Moore for my wall color. Loved it. what is the wood and finish used for the floor and cabinets? - what is the wood and finish used for the floor and cabinets? What is the countertop? All green granite I've seen is much darker. What company is the cabinet manufacturer and what type of wood and what finish is it? Thank you. manufacturer of cabinets - Hi Do you know the manufacturer of these cabinets? A TDD in a kitchen, combined with canned lights, makes the space warmer than the canned lights would alone. If multiple TDDs are installed in a space, reducing the use of electric lights, it also reduces the room's heat gain, says SolaDesign Systems, another maker of TDDs. This can save even more electricity and money by lessening the need for air conditioning. Wood floors like mine....cabinet color too light?? ?